As the vandalisation of the statues of the Great Indian leaders continue the integration of the soul of India is under threat. PM has strongly condemned and warned against such low acts and all true Indians fail to understand why is this happening?. This is really un understandable that Indian society has still not learnt to respect its leaders; whatsoever be their ideology or thoughts but they all fought for the freedom of India and contributed in the liberation of country from foreign yoke and in establishing a free Indian modern state. 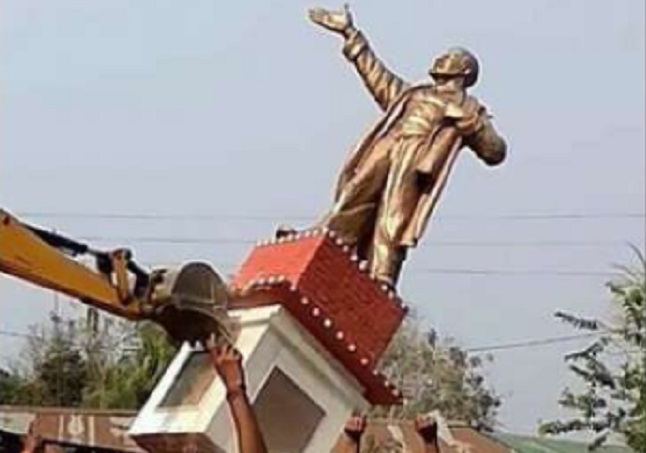 The vandalisation of statues though reveals the other hidden aspect of Indian society where political polarization is acute and integration is at loss. From Periyar to Ambedkar to Subhash Chandra statutes have been dishonoured. The show is rare in a democratic country like in India where all exhort the lofty values but ground reality exist somewhere else. The need is to decode the inner elements of non cohesion in the society. Whenever the society is cleaved then political parties take birth. Indian society is cleaved from inside on several points, from caste to religion; from gender to unequal distribution of resources. The society is a fertile ground to make emerge several political parties. When religion becomes a point of cleave then society turns polarized if political maturity is lacking in the leaders and parties, India is a classical case of this cleaved social system where ideological cleavages have been accentuated in recent time. This makes India society non cohesive from inside. The political socialization has been established on the platform OF these cleavages; as a result the new generation is indoctrinated and the clear perception about the prevailing things are blurred. Since childhood some organization, individuals teach the young buds those things which have no relevance in the age of Artificial Intelligence but development of such stereotyped mindsets help to obstruct the development in the right direction and the vandalisation is its result. Those who vandalized the statues in reality had no respect for those who stood on the opposite side. They dishonoured the great ones as India of today experience-that Patel is of BJP and Nehru belongs to Congress though both had fought together for the liberation of country.The polarization of leaders in Indian politics is a rare and retrogressive act leading to psychological disintegration of the people. Vandalism is also psychological disintegration of the masses but moot point is who taught the volunteers to go for such deplorable act? The answer is not difficult to find- it is the teachings of different political parties, their leaders to their activists to work on social cleavages. The act should have been to bridge and fill the gaps in the cleavages but reality lies somewhere else. What are the lessons of such activities and what needs to be done? First – India needs psychological integration not the words on integration. Second- political leaders and political parties need to restrain themselves from making the people and country separated by saying useless, unscientific things to their volunteers. Third – social cleavages should not be exploited by any political parties. Fourth- all Indians are one and they need to respect all leaders whatsoever be their affiliations. As all contributed in some or other way in the development of India. Fifth –no political party should try to furcate the leaders as has happened in case of Patel- Nehru. This is against the true spirit of Indian freedom struggle, the values which Fundamental Duties want us to follow. Sixth- citizens need to understand that all will move away but India as a country will always exist, so need is to come together and defeat any challenges like disfiguring of the statues. Seventh- intellectuals have special role to play. They should produce such thoughts which are not party specific but country specific as integration of all. Eighth-role of youth is crucial now as India of tomorrow will be made by them. They need to imbibe the true and constitutional values, not to be led astray by unscientific indoctrination. Ninth-integration and inclusion of all be made possible by all Indians and reject that leader and party which talks about regional identity, group identity or places any group down. Tenth – all sane people should come together and fight against any such negative tendency or activity. Therefore a new mass movement against all social cleavages can take birth. If people decide then activities like dishonouring the statues of Great people of India will automatically die. No indoctrination or political socialization can withstand against the voices of wise, sane people and constitutional values.